Brad Johansen with Lauren Hill. The Illinois native came here in March 1992 to anchor Channel 12's first Saturday morning newscast. He explained to me in December why he decided to leave for North Carolina. 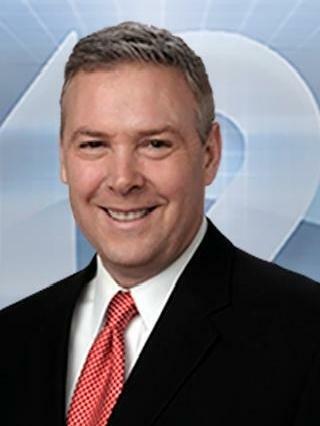 Brad Johansen leaves WKRC-TV after February "sweeps" end Wednesday, Feb. 28. Johansen became sports director when Ken Broo quit in 1996; did play-by-play for Bengals radio and on TV for Fox Sports Ohio TV and CBS; was forced to go back to news anchor in 2014; and then broke the story about a young college basketball player named Lauren Hill. He's a talented, versatile, caring storyteller who will be missed. Greater Cincinnati charities will miss him too. Brad and Colleen Johansen have raised more than $2 million for charities through their golf outing and 12 years of "Party for a Purpose." "We wanted to make a lasting difference in people's lives. I hope we have." So we owe him, too. 12. We may have been if not the first, one of the first local stations to start a Saturday morning newscast. 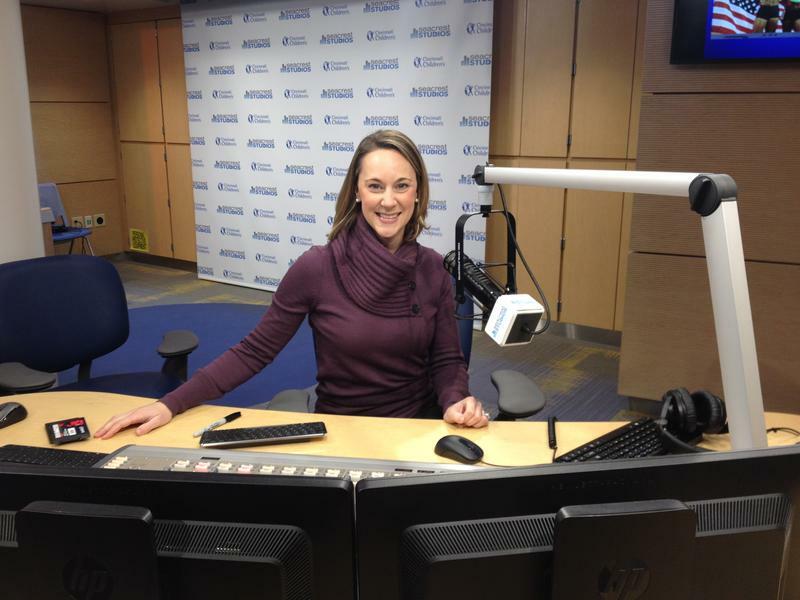 It was a 3-hour solo anchored broadcast with just a few people on staff to make it work. Mike Buresh did the weather, I did the news and a lot of the sports. We were flying by the seat of our pants but it was that kind of chaos that I loved because the people working on it really cared about the product. 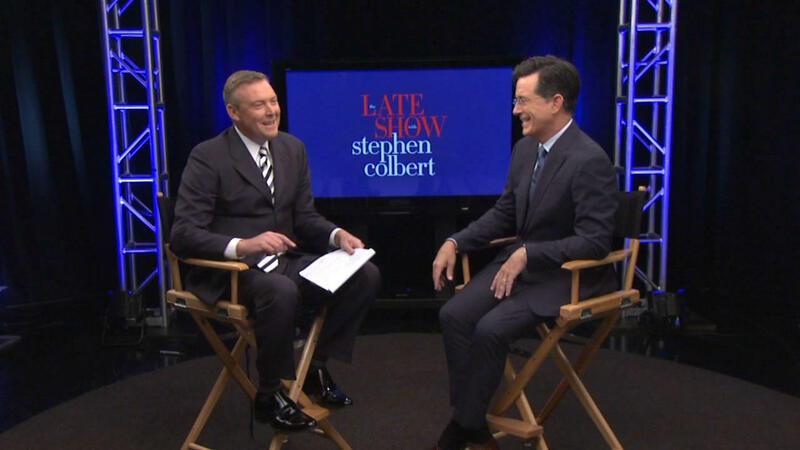 Brad Johansen interviewing Stephen Colbert before he took over the "CBS Late Show" in September 2015. 11. I was blessed to tell the stories of several angels put on earth. Tory Koch was the first. A brilliantly shining light from Lebanon who suffered from Cystic fibrosis and needed a double lung transplant. She got it, but didn’t last long. Long enough to make people laugh, cry and love more deeply. Several years after her death her mother dropped off a dress Tory wore that my daughter was baptized in. The note from Tory read “Mom, Brad is going to have a daughter. Make sure you get him this dress for her to be baptized in.” It fit perfectly! 10. I did a feature story in 1993 that brought me my first Emmy award in Ohio. We heard on the scanners for officers to head to an address because ducklings had fallen in a sewer. We went. Officers never showed. S0, we helped the homeowner fish them out. It was a storytellers dream! I used the line “I think that’s why they call it..Duct(k) tape." 9. I started a "Newsmakers" talk show that I brought here from Las Vegas where I interviewed tons of celebrities who would come through town. We turned it into a political talk show to showcase local issues. Dan Hurley took it over when I became the Sports Director. I love interviewing in-depth to provide people a chance to truly reveal who they are. Sparky Anderson may have been my favorite guest in studio. He had an amazing aura. Flying to Chicago to interview Stephen Colbert before his debut with "The Late Show" was a thrill. 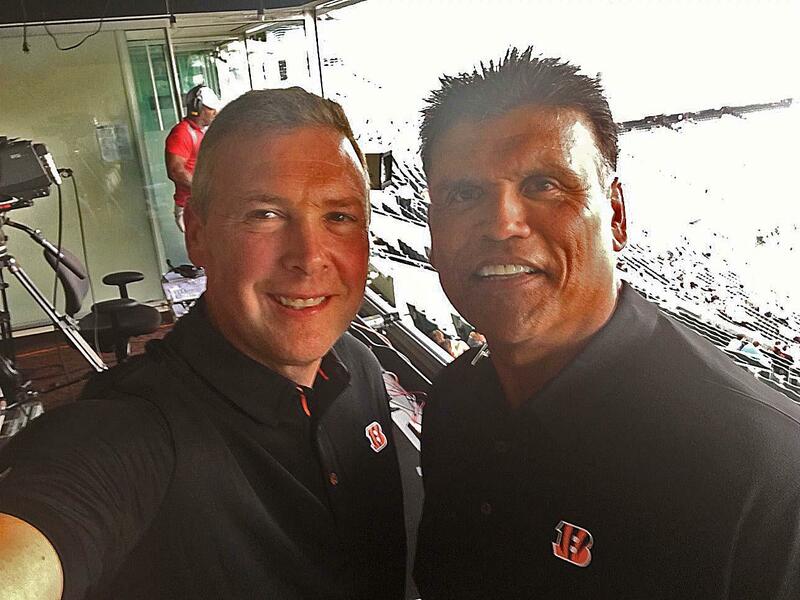 Brad Johansen with Bengals Hall of Famer Anthony Munoz, his TV partner on Bengals preseason games. 8. We started the "Friday Night Final" in ’96 as the first extended Friday night sports show to feature high school highlights. Everybody does it now. Our first show may have been the worst in the history of broadcasting. 7. My buddy Anthony Munoz invited me to his house as the artist sculpted his Hall of Fame bust for the Class of ’98. Then we traveled to San Diego for the announcement, and watched Super Bowl XXXII and John Elway’s first Super Bowl win. 6. I loved creating franchises that were so memorable for people in Cincinnati. "I Got Next" featured me making a fool of myself in various sports related competitions. Actual drag racing may have been the most frightening, ballet maybe the most embarrassing. "Child’s Play" was an Art Linkletter rip-off of "Kids Say The Darndest Things" but it was a blast getting kindergartners to explain life to us. 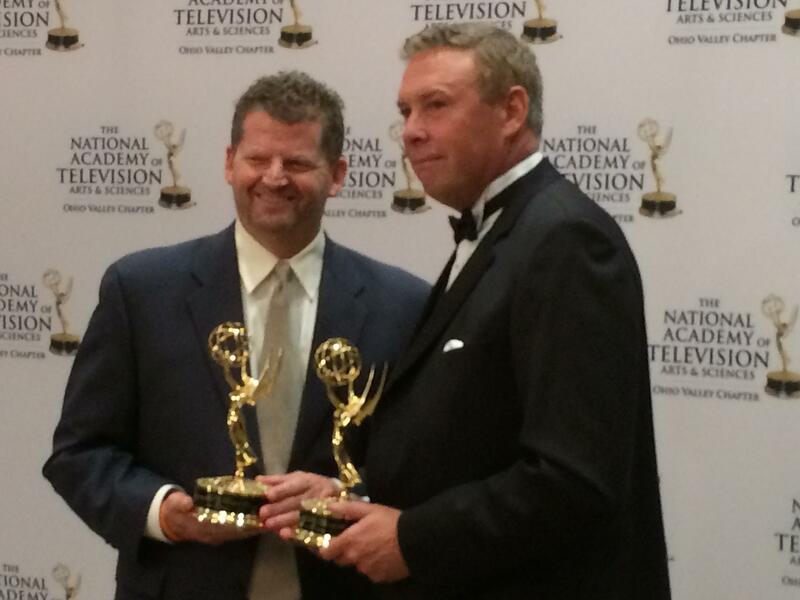 WKRC-TV videographer Eric Gerhardt and Brad Johansen with their Emmy Awards for their Lauren Hill "#Playfor22" documentary about Lauren Hill. 5. Sam Boling (Jameson) was another angel. She’s still on earth with us. Beaten death over and over with CF, double lung transplant, cancer, losing an eye, and battling everyday with her husband Ty to show everyday matters, and love really does conquer all. 4. Sept. 21, 2014: I got to call the Bengals-Titans game for CBS with Chris Simms. I told my wife that day, "If I never get to do this again, it's ok, because this was one of the greatest days of my life, and that feeling will last." It has. 3. Nov. 2, 2014: The greatest day of play-by-play really didn’t involve much play-by-play. I called Lauren Hill's first collegiate basketball game with Debbie Antonelli and Betsy Ross. 10,000+ saw it in person. Millions watched on TV. A lot of game-day professionals worked that game for free -- crew members who’ve done Super Bowls, World Series, NBA Championships. To this day, they tell me: "THAT was the greatest game I ever worked!" 2. 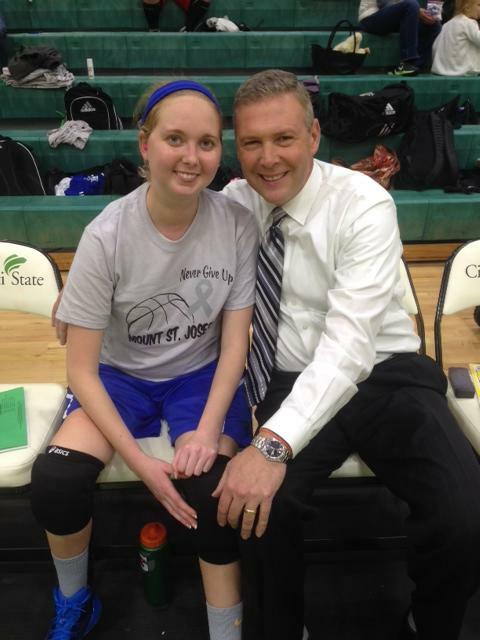 Lauren’s story was the first one I did when I left the Sports Anchor chair and had switched to the News Anchor desk. "One Last Game" went viral. It changed my life. It changed her life. She changed millions of lives. I came up with the idea of “#layupforlauren” and helped her raise her first $1 million. The documentary Eric Gerhardt and I produced on her life, "#Playfor22' may be the best thing I've ever done on television. I hope to carry on her mission wherever I go. Cure cancer. Tell people you love them every day. We only get today, so make the most of it. "Never Give Up." 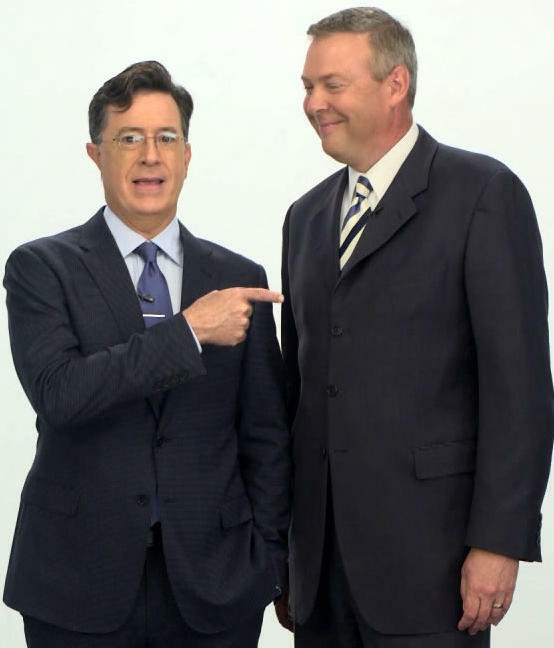 Stephen Colbert and Brad Johansen in 2015. 1. I've lived in Mason for the last 20 years. What a special community it has been for our family. My two oldest boys are working and thriving in Nashville and Atlanta respectively. I've been blessed to coach my only daughter in softball, and my youngest son in basketball. I'm not a good coach, but I'm getting better at being a father. My wife, Colleen, and I have helped to raise more than $2 million dollars for our community going to multiple different charities with the "Brad Johansen Golf Classic" and the last 12 years of "Party for a Purpose." Our last one will be on April 7th at Duke Energy Convention Center if you want to help us put a few more dollars to good use before we go. We wanted to make a lasting difference in people's lives. I hope we have. I arrived in Cincinnati in 1992. I planned on staying for two years. 26 years later it’s time to go. WKRC became home to me. I owe so much to this station, and more importantly to the people who watched this station. Viewers have invited me into their homes for more than a quarter-century, and they passionately shared with me how much they care. I’ve felt hatred. But I’ve felt much more love. This is a special place. I’m leaving, but I won’t ever be completely gone. I hope for a few people, there are some positive memories I will leave behind. Thank you Cincinnati. I owe you. And this one belongs to Marty! 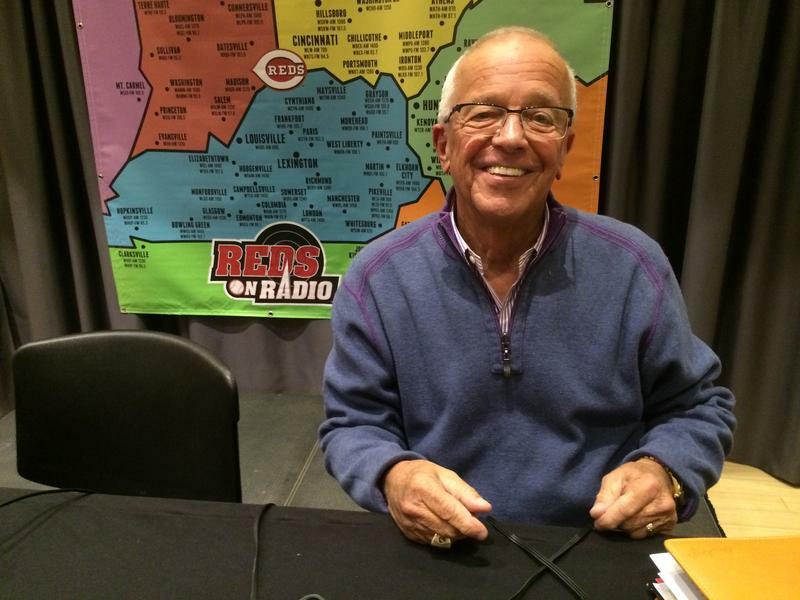 I recently heard Reds radio voice Marty Brennaman give his overview of the 2018 Reds, and I thought Reds fans would want to read it.